Lee Kum Kee have some of the best Chinese ingredients available in the UK. 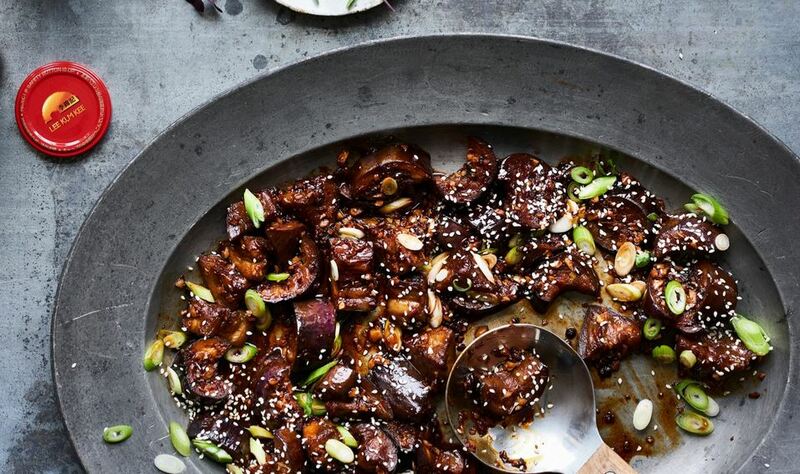 Celebrated Chef Ken Hom takes advantage of these in this recipe for Spicy Aubergines. Delicious! 1 Trim and cut the aubergines into 2.5 cm (1 inch) cubes. Sprinkle the cubes with salt and leave them in a sieve to drain for 20 minutes. Then rinse them under cold running water and pat them dry with kitchen paper. 2 Heat a wok or large frying-pan over high heat until it is hot. Add the oil, and when it is very hot and slightly smoking, add the garlic, ginger and spring onions and stir-fry them for 30 seconds, then add the aubergines and continue to stir-fry for 1 minute. Then add the rest of the ingredients. Turn the heat down and cook uncovered for 10-15 minutes until the aubergine is tender, stirring occasionally. 3 Return the heat to high and continue to stir until the liquid has been reduced and has thickened slightly. Turn the mixture onto a serving dish and garnish with the chopped spring onions tops.